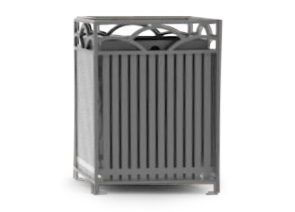 The Summerfield series steel outdoor trash receptacle presents a modern style with gentle curves. Featuring a steel, flat top lid with 8-1/2" diameter trash disposal opening and convenient mounting holes at the bottom for securing to concrete. Black, 32 gallon plastic liner included.